Small friendly classes introducing you to yoga breath, movement stretches and so much more. Any age, flexibility and fitness can join. I have a unique opportunity to study with my Teacher in India at the Jois' institute in Mysore in January 2018 for 4 weeks. This safe, gentle & powerful energy healing system for physical/emotional challenges and illnesses, appropriate for those undergoing medical treatment. Angelic Reiki draws from the Usui and Shamballa lineages combining these with powerful transmissions channelled by Kevin Core. This holistic treatment facilitates healing by clearing blockages and re-balancing health on a physical (pain, injuries), emotional (memories, trauma) and karmic (genetic) level. Ka Huna bodywork originated in the South Pacific and was used during rites of passage as a transformational massage and healing system. It is also known as Hawaiian temple massage and Lomi Lomi. Ka Huna bodywork is for everyone and is tailored to your individual needs, including pregnancy massage, deep tissue massage and intensive deep tissue work or a luxurious massage for relaxation. Ka Huna can also improve flexibility and help injuries heal faster. Introducing you to yoga & so much more.. There will be a class for you, come and try. 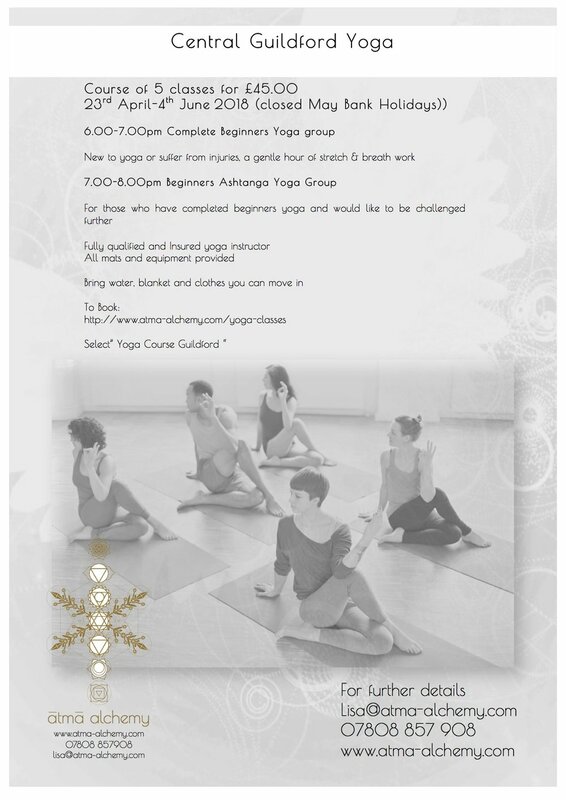 Free Taster/sample Yoga classes - Limited places. 11.00am Beginners & post pregnancy (for gentle stretches for any age). 11.50pm Beginners Ashtanga Yoga Vinyasa Intense stretching, cardio vascular healing system direct from India. 12.50pm A talk on History & origins of yoga class, authenticity of Yoga and, The yoga sutras and meditation. 11am - 1pm Divine goddess Yoga “pop up” shop selling clothing, mats and bags available to purchase.